Our old alma mater is the only Catholic school in the small and quiet city of Catbalogan (Philippines) of around 90,000 people. Just like me, most of my classmates hail from Catbalogan and other surrounding small towns and barrios. Most of us spent our formative years together— a year in kindergarten, six years in elementary and four years in high school. We knew that our high school graduation was sort of our break-off point. From there, each one of us headed our separate ways, chased separate dreams. I went to Manila, the nation’s capital. It was common for people like us who grew up in the province to move to the big city to study and then work. A few would return home. I attended university at De La Salle University. Some chose to stay in Catbalogan and many of them now work and serve our hometown. I am proud of what we’ve accomplished individually. We are now successful accountants, engineers, doctors, nurses, pilots, educators, judge (youngest in the country), businessmen, politicians (vice mayor of Catbalogan) and many other professionals. It is seldom that someone brings together 30 or more friends from 20 years back to reminisce the years spent together. That was what Gerry Dasco managed to accomplish for us, his high school batch mates of ‘93 from Sacred Heart College (now called St. Mary’s College). I see updates from classmates and old friends in Facebook almost everyday. I am often just browsing and curious about what they do now and how their families are. From time to time I look at their pictures and am amazed at how older and mature we’ve become and how fate have brought us to different journeys. On a few occasions, when I am able to, I greet classmates on their birthdays and congratulate them on their triumphs. It was always limited, sporadic chance encounters and more often without frills, without conversations… until Gerry brought us together! I remember Gerry as being a shy, quiet, simple gentleman in school. He was definitely not the type to gather folks together for a party with the promise of conversations, dancing and beer. Gerry waited for his moment and he did the most amazing thing— something most of us wouldn’t dare do or couldn’t do for many years now. He orchestrated an event conceived so creatively. How he managed it with simplicity amazes me. First, Gerry posted old scanned pictures from his high school photo album in Facebook. He then tagged everyone, wittingly and knowingly inviting us to look. That started the flow of conversations, sharing, questions, and remembrance. He didn’t stop there; Gerry made a collage of old photos and new photos (picked from Facebook) put them side by side — kind of showing the before and after photo of each one of us. 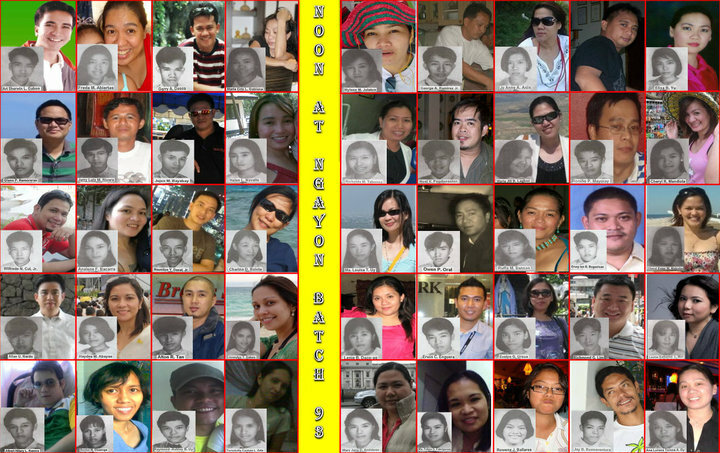 The collage brought even more friends and classmates into Gerry’s organized (virtual) high school reunion. The beauty of it was that he even got us to take it to the next level… all the way to how we would organization the hosting of the alumni homecoming event in 2017. It’s amazing! A lot of us thanked Gerry for what he did; he clearly gets this social media thing that many of us are still just starting to grasp. Gerry is my ultimate social media guy! He understood that the key to successful social-networking and reunion is to be deliberate. He understood that the simple concept of Web 2.0 and social media revolves around the convergence and interconnectivity between links, users, and information. He transformed interactions between his batch mates from just sharing meaningless frivolity to being purposeful and it naturally led to real-time conversations. Gerry was focused and thought about how to capture what is important from the network, and organized our interactions accordingly. Most of all, he created for us our own social space. Our gratitude goes to you Gerry, thanks for your effort, as you witnessed in Facebook, you got everyone reconnected, it’s an awesome achievement! Hope to see you soon. It’s really amazing what social media can do. I have to admit I’ve never thought of attending our homecomings, much less actually working towards making sure I am around town when it happens (Even avoided events that would bring me back in contact with the guys :). Probably because so much happened before we graduated that I would rather not be reminded of. Gerry’s post, and our subsequent exchange, however, reminded me of the wonderful persons who have made an imprint on my life during what I consider to be the most influential years of my life. Now, I believe I am ready to face the batch again. Kudos to you Gerry! Hayds, glad you’ve allowed yourself to reconnect with old friends, I am very happy for you… Gerry and Facebook was just the channel or enabler, you did it. Hope all is well with you and your family!